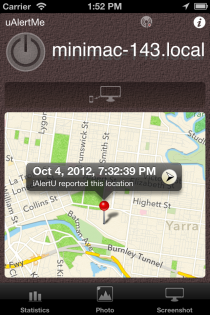 As of version 1.8, uAlertMe has been optimised for the iPhone 5 and iOS 6.0. In fact, to take advantage of some of the neat new features of iOS 6.0, uAlertMe will no longer support iOS 5.0 or earlier. 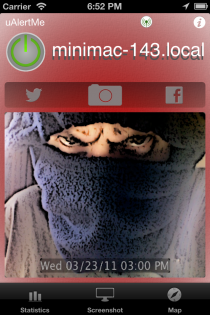 uAlertMe allows photo’s and screenshots to optionally be saved to your Photo’s saved-photos album. Using this can be handy for keeping a log of photo’s for handing to authorities when it’s time to get your Mac back. 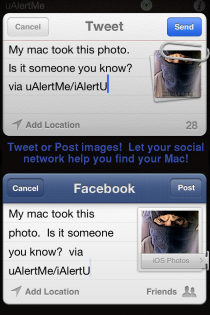 It is also possible to tweet or post a photo or screenshot to Twitter or Facebook which is a great way to get the word out to your social network if your Macbook has gone astray. In the future, these social features will grow to include other things like maps and locations.